All dental cases are not created equal, but luckily the more tricky ones can be handled with the right combination of excellent clinical skills and ideal dental lab. One of the biggest challenges we encounter in the dental practice is the case of aged or ‘imperfect’ teeth. For the case featured in this post, I dove into a situation with multiple concerns right from the outset. I was determined to get it right by carefully assessing patient needs and delivering on expectations. Honestly, life as a dentist would get boring if there weren’t a few curveballs once in a while. 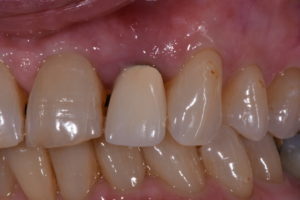 A seventy-seven year old female presented with the need for some serious restorative work. 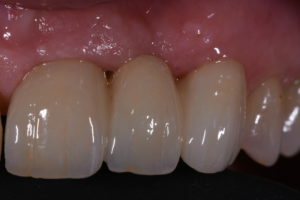 In particular, tooth #10 had a non-restorable endo-perio lesion. I could have looked at this as a headache, but instead I embraced the challenge. I prepared teeth #9 and #11 while also making the decision to remove #10. A temporary bridge was placed for eight weeks prior to final impressions. In total, there were three appointments for a treatment that lasted 11 weeks. The patient was so pleased with the outcome! Check out that beautiful transformation. The key for this case was being very clear about the intended aesthetics. Creating conditions that result in ‘imperfectly perfect’ teeth requires photo communication as well as verbal or written communication with the lab. Just telling your lab technician to duplicate the photo is not good enough. Write down what you see exactly and what you would like to duplicate. Better yet, annotate the photo in your presentation software, be it Keynote or Powerpoint! For this case, I worked directly with Gold Dust to capture my vision of the patient’s smile. How do you ensure clarity and understanding in your communications with the dental lab? We’d love to hear from you!